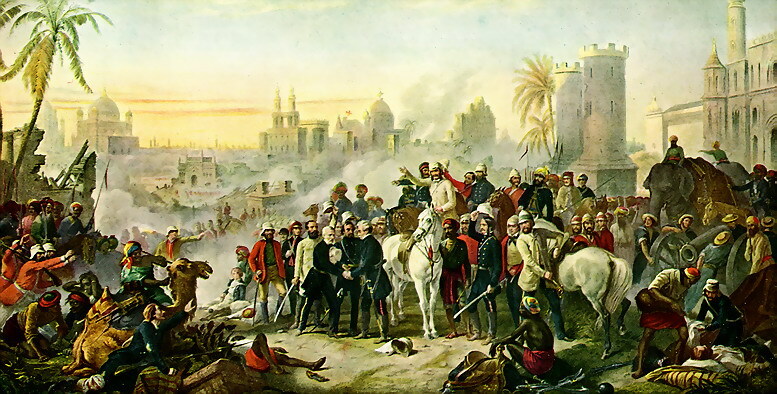 One of the important events of Indian history is the Revolt of 1857. It was the first rebellion against the East India Company which took the massive form. The main persons behind this rebellion were the soldiers [sepoy]. That is why it is also called sepoy Mutiny. But the revolt did not remain limited to the soldiers, later it spread and took a massive form. Some people also called this-‘India’s first war of Independence’. The revolt was started on 10th May of 1857 in the town of Meerut. Though in some places, fractional clashes began before that. It ended on 20 June 1858. The first martyr of 1957 revolt was Mangal Pandey. He attacked his British sergeant on 29 March 1857 at Barrackpore. Some of the leaders of the rebellion were- Rani Lakshmibai [Jhansi],Kunwar Singh [Bihar], Bahadur Shah [Delhi], Nana Saheb [Kanpur], Tatia Tope [Kanpur], Begum Hazrat Mahal [Lucknow]. There was a deficiency of central leadership. The revolt was started due to the induction of enfield riffles in the army. It was believed that the cartridges used in the riffles were made of pig fat and cow fat which were restricted for the Muslims and Hindus respectively. They protested against these. Lord canning was the governor general at that time. 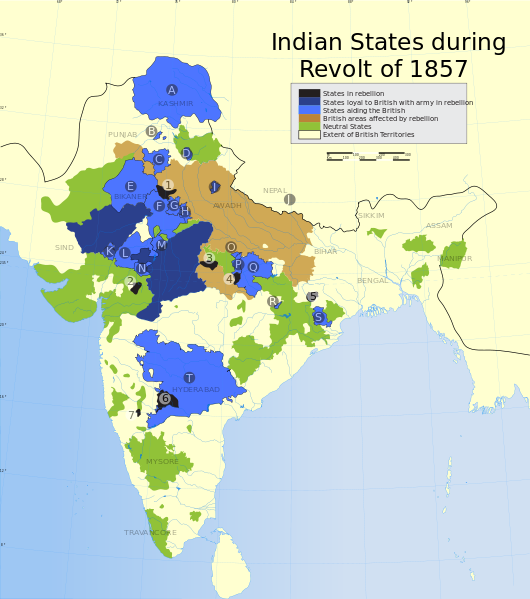 The revolt was failed to spread across the India. Some epicenters of the revolt were- Kanpur, Lucknow, Aligarh, Agra, Arrah, Delhi, and Jhansi. Induction of enfield riffles in the army, catridge of which had fat of cow and pig. Hindu and Muslim soldiers protested against this. There was discrimination among the British and Indian soldiers. British soldier’s behavior was rude against the Indian soldiers. The policies used by the British for territorial annexation [Doctrine of lapse, Subsidiary Alliance] angered the Indian rulers. There was fear that British were converting Hindus and Muslims in Christianity. The social reforms introduced by the British made some of the people angry. There was communication gap between the leaders of different parts of India. There was no central leadership and the rebellion got limited to some parts of India only. Rebels did not have enough weapons and finance where British people had advanced weapons and enough finance. Lack of planning and discipline among the rebels. East India Company’s rule ended in India and the ruler ship was handed over to the Queen Victoria. Reforms were introduced in the army and all the steps were taken so that no such incident occurs in the future. Indian’s were assured of better governance. It was declared that there will be no discrimination and people will have more power and respect. Doctrine of Lapse was withdrawn.